1. Mix dry ingredients (*) in a bowl with a whisk. 2. Beat an egg in a different bowl, add milk, and mix well. 3. Add the dry ingredients (1.) 1/3 at a time, and mix just until blended. 4. Add cooking oil and mix again. *DO NOT mix too much! 5. Cover with plastic wrap and leave to set for 5 minutes. 6. Meanwhile, heat a non-stick frying pan over medium heat. Place the pan on a wet towel to cool down the pan a little bit. 7. Turn the heat down to low, place the pan, pour in the batter onto the pan, and cook until bubbles appear on the surface. 8. Flip with a spatula, then cook for a minute until browned on the other side. Repeat the steps to make 2 each of large, medium, and small pancakes. 9. 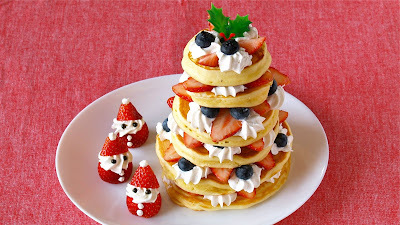 Stack up the pancakes putting a layer of whipped cream and berries between each pancake.